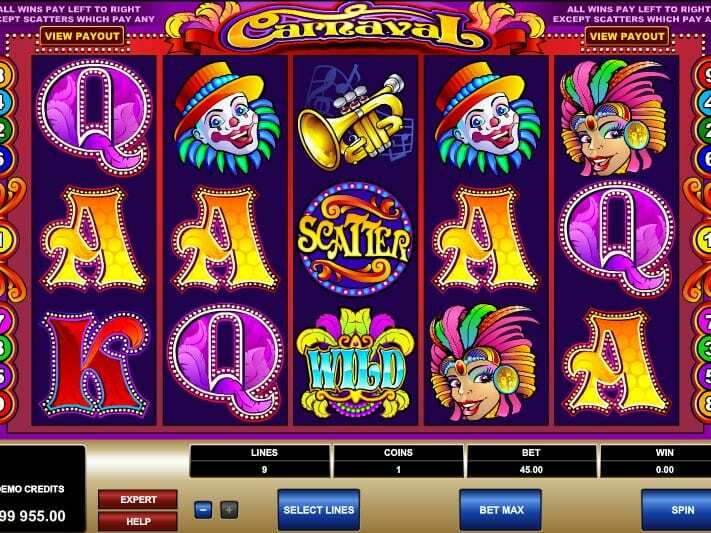 Carnaval is a classic slot game from masters of the online gaming world Microgaming inspired by the exuberance of a Latin American street festival. 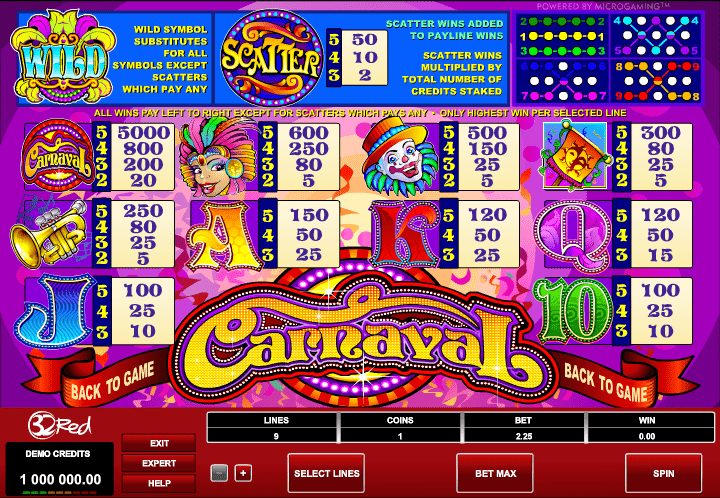 The red background is bright and inviting, while the premium symbols include painted clowns, showgirls and feather headdresses to develop the theme. The game, like a mariachi band, is fast-paced with an almost 97% payout, 5 reels and 9 pay-lines to keep the action going. Wins are enhanced by wild symbols and scatter symbols which multiply the number of credits wagered. Veteran gamers might recognise the frame from another Microgaming classic: break da bank. Take a look at our new slots from the same developer as well! Ever since it’s inception in 1994, Microgaming has firmly established itself as one of the world’s leading online gaming developers with over 850 games to date as well as providing software used by online casinos all over the world. If you'd lie to see more of the play slot games online offered by this developer then click here. 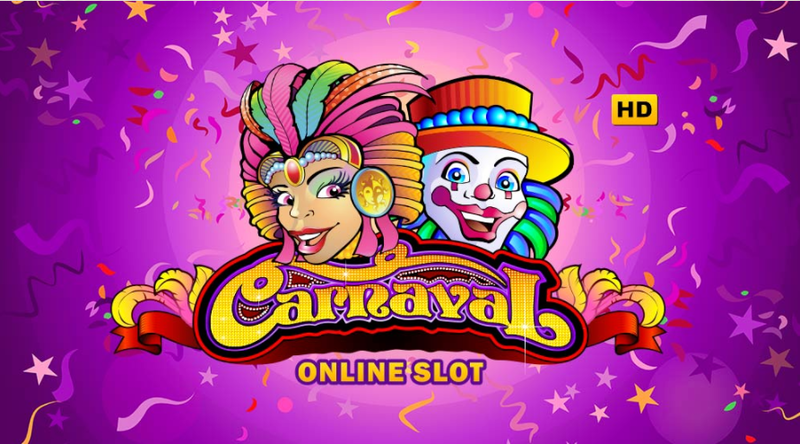 Carnaval is one of Microgaming’s more simplistic online offerings, but that isn’t to say that the bright colour scheme and maraca-shaking sound effects won’t be right up your street. The game uses the same frame as break da bank, another popular Microgaming slot, with five reels and nine win-lines giving multiple opportunities for dancing in the street with your big cash win. Here's a guide to help you discover more options in playing slots. Watch out for the feather dress wilds which substitute for all symbols except for scatters. Speak of which, the scatter symbol is one you’ll definitely want at the party while playing Carnaval as two or more symbols act as multipliers on the number of credits you have staked. Carnaval will most likely appeal to players who like retro casino games but that in no way diminishes the quality that Microgaming has brought to the table with this vibrant offering. Because there is no bonus round to speak of, big wins are determined by wild symbols (which substitute for every symbol except for scatters) and scatter symbols turning up to the party. The good news is that with low variance, this isn’t an online slot that keeps you hanging on, so get on your dancing shoes and give it a try!